Warwick Dunnett's Poker Wizards: Wisdom from the World's Top No-Limit Hold'em Players collects contributions from several of the circuit's most accomplished players in a single volume. The book's primary focus is no-limit hold'em tournaments, although several contributors offer comparative observations regarding limit hold'em and cash games, and all provide advice about the psychology of poker, tells, bankroll management, and other areas of concern to non-NLHE players as well. Dunnett's chosen "wizard" conceit is misleading, actually, as the primary purpose here appears to be to dispell the notion that success in poker is somehow linked to "magic" or non-rational explanations. Indeed, while there are numerous differences in these players' approaches and styles, all more or less agree on the importance of study, discipline, and hard work to improve one's game. The group recruited by Dunnett is certainly eclectic. Dan Harrington and T.J. Cloutier are already well-established authors, part of a select group of the most-read poker writers living today. Daniel Negreanu and Mike Sexton also have previous titles under their belts, and Chris Ferguson has made some highly regarded contributions in other contexts as well. 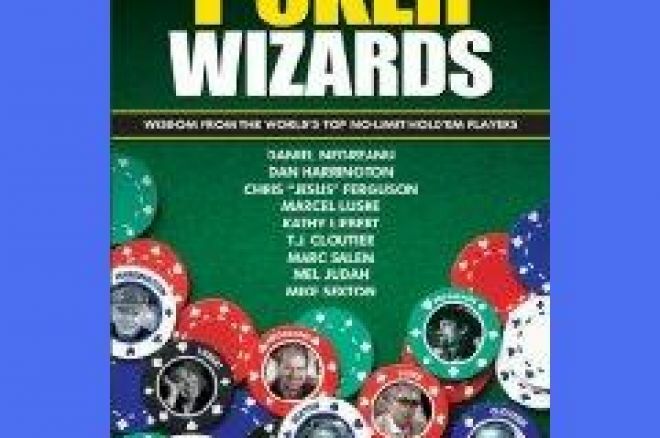 Also included here are chapters by three pros who are relative newcomers to the world of poker books — Marcel Luske, Kathy Liebert, and Mel Judah. Rounding out the volume are contributions from Marc Salem, a non-poker playing author who has previously published books about body language, and Dunnett himself. Ferguson's chapter gets the book off to a good start with insights about "intellectualizing gut feeling," game theory, and other items of interest. His chapter also sets a precedent for the rest of the book in its not-so-obvious organization. The headings are helpful, but the sections within each chapter do not tend to flow very obviously from one to another. Most of the pros touch on certain areas of emphasis, such as "tournament strategy," "starting hand concepts," "tells," "money management" and the like. But none really approaches a comprehensive, coherent set of guidelines. What one gets, rather, are a series of conversation-like chapters in which the pros variously provide nuggets of wisdom — or "wizdom," as Dunnett has it. Negreanu's entry follows, and perhaps has the most valuable advice in the book regarding psychological issues and various qualities Negreanu believes are needed to become a successful player. Subsequent contributions by Harrington, Cloutier, and Sexton mostly reiterate what each has said elsewhere about poker in general and no-limit hold'em tourneys in particular (e.g., Harrington summarizes "inflection points" and zones; Sexton champions aggressive play). These chapters thus serve as introductions to these authors' core ideas for readers unfamiliar with their other writings. One interesting facet of Poker Wizards is to see the pros disagree about certain particulars. For example, each has something to say about bankroll requirements for tournament poker, though the recommendations range from 20 times the buy-in (Sexton) or 40 times (Liebert) all of the way to 200 times (Ferguson). Judah gives the most thorough advice on this subject, incidentally, recommending satellites and cash games as a way of subsidizing one's tournament expenses. Of the new authors' contributions, Luske's is probably the most interesting, particularly his points about preparedness and the mental aspects of the game. Like almost all of the other pros (Harrington being the exception), Luske says playing your opponent is more important than playing your cards, although interestingly he concludes by saying hand selection is the most important skill for new players to develop. The point here concerns the importance of remaining comfortable at the table — the idea being if you manage hand selection with care, you'll avoid difficult, anxiety-producing decisions. As far as the non-pros' contributions are concerned, both are more helpful than one might expect. The description of Marc Salem as a "world-renowned mentalist" probably doesn't sound too encouraging to serious poker players, although his chapter does provide an interesting discussion of physical tells that adds to what the pros have said along the way on the same subject. Dunnett's own summary chapter — besides being one of the better-organized sections of the book — provides some additional thoughts about online play and home games. While no Super/System, Poker Wizards does provide potentially useful insights for no-limit hold'em tournament play, as well as introductions to the ideas of some of the circuit's most successful personalities.